1. Hovering your mouse over the basket will open up a small window displaying the exercises you have added to your basket. 2. Simply click on the tick by the relevant exercise to remove it from your program. 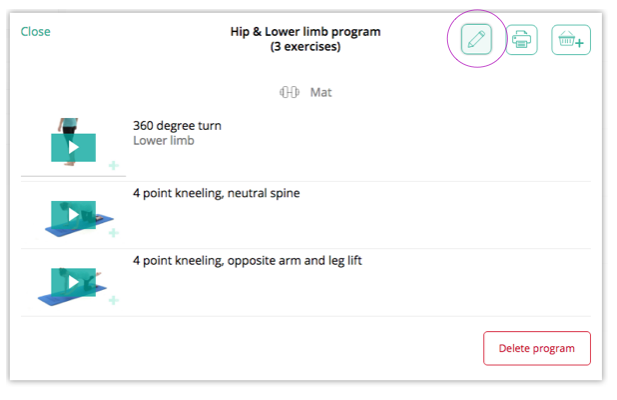 Once you are in the program editor window, you may wish to remove exercises here. b) From the exercise preview window click on the red basket with a subtraction sign in the top right corner. 3. Remove (and add) exercises with the same method mentioned above (red cross and/or subtraction basket). 4. Finally click " Done" when complete. These changes will now be updated in this saved pre-set program. NOTE: You can only amend your own pre-set templates, not the Physitrack pre-loaded programs. To amend a Physitrack pre-set program, you will need to copy the program to your library, then save the changes as a new program. Why are there already programs in my templates library?